Things around us is known as Environment. It consists of living component also known as biotic component and non-living component also known as Abiotic Component. There are two types of ecosystem- natural ecosystem and artificial ecosystem. The ecosystem present naturally is known as Natural Ecosystem. Example of Natural Ecosystem are forests, grasslands, deserts, ponds, lakes, rivers, estuaries, sea. The ecosystem which is man-made is known as Artificial Ecosystem. For Example Gardens, Aquariums and Agro ecosystem which is the largest manmade ecosystem. Abiotic Factors Include - Climatic factors such as rain, temperature, wind etc. 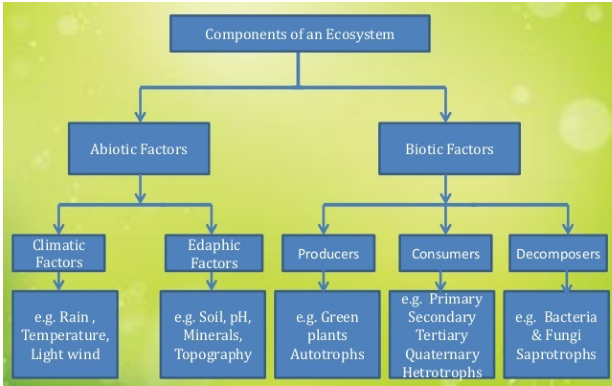 Another abiotic factor is edaphic factors such as soil, pH, minerals etc. Producers which can make their own food, such as plants, blue green algae etc. Consumers feed on producers. Such as herbivores. In consumers there are- primary consumers, secondary consumers, tertiary consumers etc. Carnivores are flesh eating animals. Omnivores consume both plants and animals. Parasites live inside and depend upon living host. Saprophytes feed on dead remains of plants and animals. Food Chain is defined as series of organisms in order in which organisms feeds on another organism. There are various steps in food chain in which energy is transferred, each level is known as trophic level. Energy is always transferred unidirectionally. There is a unidirectional flow of energy from producers to consumers. There are generally 3 to 4 trophic levels. Organism can occupy different trophic levels in different food chain. A 10 percent law is followed in energy transfer which was given by Raymond Lindeman. 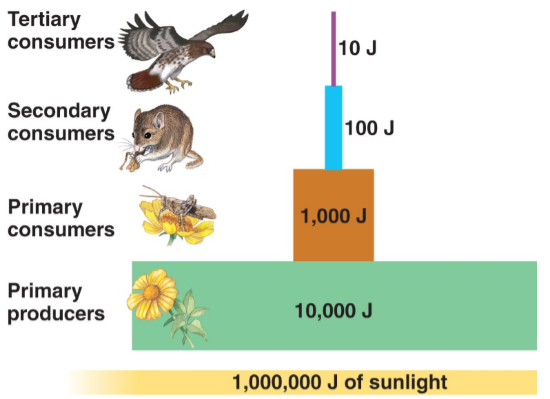 This law states that “only 10 percent of energy is transferred from one trophic level to another trophic level”. The remaining 90 percent will be used by the present trophic level in different processes. Therefore there are usually 3-4 trophic levels in a food chain. 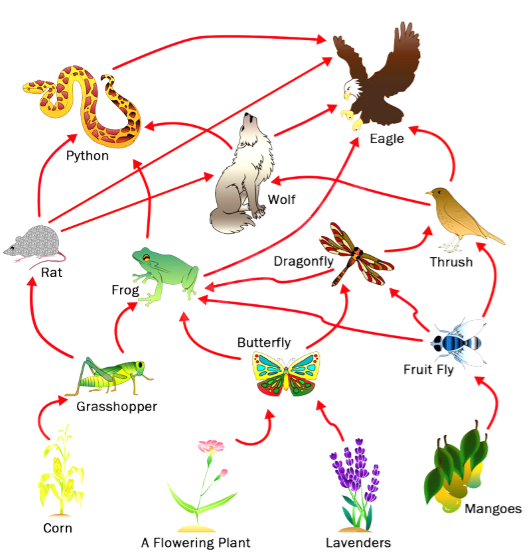 Interconnection of food chain is known as Food Web. It shows how food chain are interdependent. Food webs are never straight as they are formed by interlinking of food chains. Food web provides alternative pathways of food availability. If a particular species is destroyed, the predator can feed on an alternative species. Food webs increase ecosystem stability. Ecological Pyramid is a graphical representation to show biomass or bioproductivity. There are different ecological pyramids such as pyramid of biomass, pyramid of number and pyramid of energy. Pyramid of number indicates number of individuals at different trophic levels. 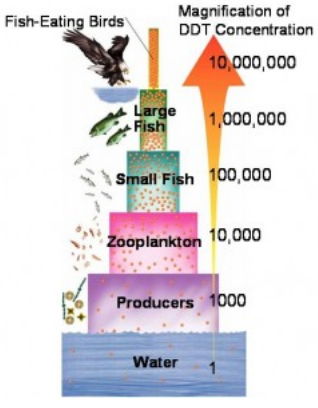 Pyramid of biomass indicates biomass of the members of the food chain present at different trophic levels. Pyramid of energy indicates energy at different trophic levels. Pyramid of number and pyramid of biomass can be inverted also. 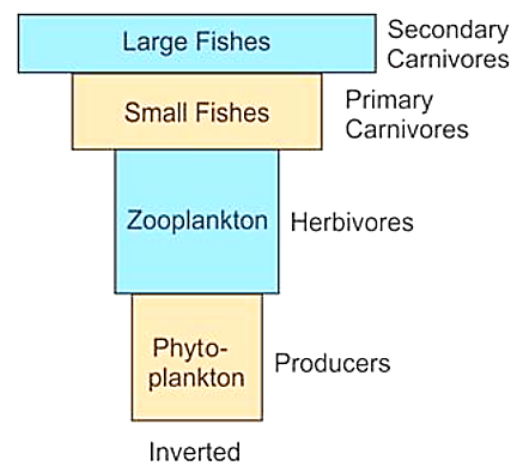 In aquatic ecosystem pyramid of biomass is inverted. The concentration of harmful substances increases with every trophic level. This is known as Biomagnification. Addition of pesticides in one trophic level increases the concentration of pesticides in other trophic level. High UV radiation break down oxygen into oxygen atoms. 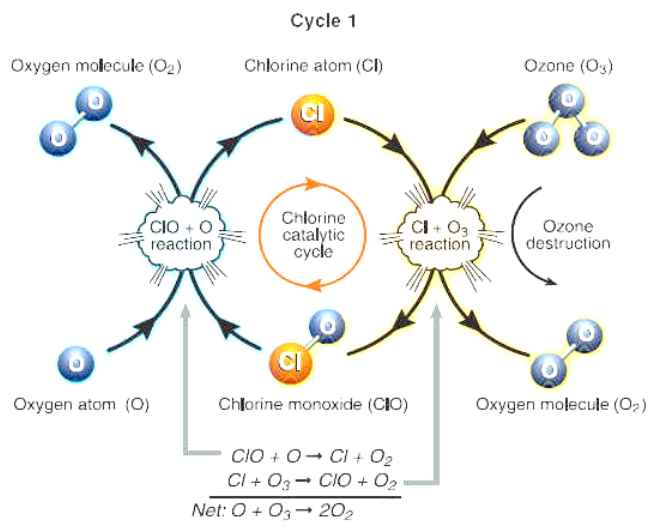 These oxygen atoms when combine with oxygen, they form ozone. The thickness of the ozone layer over Antarctica was found to be decreased in the year 1985. This is defined as ozone depletion. This is due to excessive use of chlorofluorocarbons in refrigerators, ACs, aerosols, etc. Thinning of ozone would allow penetration of Ultraviolet rays into earth’s atmosphere causing blindness, skin cancers and mutations. In 1987 United Nations Environment Programme (UNEP) signed an agreement to limit the usage of CFCS. This is known as Montreal Protocol. Exposure of UV rays causes skin cancer. UV-rays damage the eyes also. It affects humans, plants as well as animals. Waste materials are known as garbage. There are two types garbage - Biodegradable Garbage and Non-biodegradable Garbage. Garbage that can be completely decomposed by the microorganism are called Biodegradable Garbage., such as fruit and vegetable peel, sewage. Substances which cannot be decomposed through microorganisms are known as Non-biodegradable Garbage, For Example, Plastic, Glass, Pesticide, Metals, Radioactive Elements etc. Waste disposal is a very important part of day to day life. There are different methods of waste disposal management- sewage treatment plant, biogas plant, land fillings, recycling, incineration, composting and reuse.